Melbourne will be the stage for seven days of fashion-inspired action ahead of Spring. This year, Melbourne Spring Fashion Week (MSFW) 2012 is offering even more free events than ever for locals and visitors. 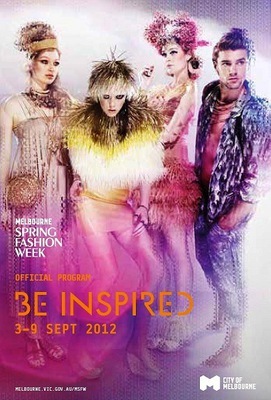 Melburnians are encouraged to 'Be inspired' and celebrate our city as a fashion destination. Lionel's Melbourne is set to dress up and party down from Monday, 3 September until Sunday, 9 September. In addition to its Designer Series, Emerging Designer Series, Look.Stop.Shop and Business Series, MSFW is celebrating its 18th birthday by embracing local talent. 4 up-and-coming Melburnians in the fashion industry were unveiled as the new faces of MSFW. The City of Melbourne informed me that home-grown faces Annaleise Smith, Ebony Edwards, Emily Trimble-Thompson and Jake Sofo will feature in the 2012 MSFW campaign. Lord Mayor Robert Doyle remarked that each of them had a unique story and connection to Melbourne, and their individual style would inspire and engage a variety of fashion palettes. I caught up with the City of Melbourne about each new face. Represented by Chadwick Models, Annaleise Smith was discovered at the age of 15 at a Melbourne train station by a Chadwick scout. She was immediately signed with Women Agency, representing her in both Paris and Milan after completing her studies. Since then Annaleise's career has gone international, working in cities like Paris, London, Milan, Hamburg, Nice, Bologna, Lisbon, Madrid, Venice, Zurich, New York and Miami. She excelled in all areas of the fashion industry, from high-end exclusive runway shows and editorials to campaign shoots. She became a campaign favourite for many Melbourne-based designers and appeared in editorial shoots for many Australian publications including Grazia, Melbourne Magazine and Australian Vogue. Annaleise has become a proven fashion week favourite around the world, walking for designers such as Altuzarra, Armani and Kenzo and shooting campaigns for world-renowned brands Escada, Adolfo Dominguez and Theory by Olivier Theyskens. She has also been placed with top agencies including Supreme in New York, and Select in London. Despite her successful international career, she misses Melbourne when abroad. An avid supporter of local fashion, Annaleise finds walking in MSFW shows the most enjoyable. Represented by London MGT Group, Ebony Edwards is a fresh face to the Fashion Week scene less than 12 months ago. This emerging star was the first national Miss Schoolies modelling competition winner at the 2011 event final in Surfers Paradise, Gold Coast, where she competed against 18 other contenders from across Australia. Ebony sacrificed her waist length hair for a sleek modern bob for love of modelling. Her career took off after walking for six designers at New York Fashion Week as part of her modelling contract with New York's Wilhelmina Models agency, considered to be one of the most prominent agencies in the fashion industry worldwide. She is now dividing her time between Sydney and Melbourne while appearing in campaigns for Jay Jays and Diva accessories. She is planning to head back to New York later this year. Ebony Edwards will be one to watch over the next few years as she builds her professional reputation in the industry. For now MSFW will provide the platform from her light to shine. Famously known as daughter to Len Thompson, AFL Collingwood champion and Brownlow Medal winner, and Bronwyn Trimble, Miss Victoria (1979), Emily Trimble-Thompson heralds from a well-known local family. However this model created a local and international identity and reputation on her own effort since she was 14. Selected by Ford Europe at 16 to model internationally, she juggled academic exams and Melbourne-based modelling assignments while living in Paris and London over 5 years. Her hard work paid off, featuring an impressive list of international clients including Chanel and Jean Paul Gaultier and regular appearances at both Paris and New York fashion weeks. In Australia she has appeared in some of Australia's most renowned fashion editorial magazines including Harper's Bazaar, Russh, Oyster, Fashion Journal and Grazia. Having appeared in her first MSFW in 2005, She's back in 2012 as the face of City Square fashion hub. Represented by Giant Management, Emily Trimble-Thompson has proven that she's a face to be reckoned with. Having appeared in her first MSFW in 2005, She's back in 2012 as the face of City Square fashion hub. Represented by Giant Management, Emily Trimble-Thompson has proven that she's a face to be reckoned with. Think Melbourne's modern man and the finger usually points to model Jake Sofo. Represented by Chadwick Models, Jake was scouted in late 2009 and thereafter rose quickly into a favourite with most of Melbourne's catalogue clients. The face of Melbourne Central, he has appeared in national campaigns for Jeans West, Mooks, Bauhaus and Edge. Jake has also appeared in campaigns for Nena & Pasedena and Dom Bagnato where he starred alongside Hawthorn football player Buddy Franklin. Internationally, he spent 3 months as Ermenegildo Zegna's in-house model in Milan. Jake balances his fashion industry career with learning the ropes of his family business in Melbourne's restaurant, bar and music scenes as the son of one of the city's famous hospitality and entertainment kings, Vince Sofo. Despite his busy schedule, he still finds time to keep fit and active with football and coaching both junior and senior athletics at Scotch College. This true Melbourne boy at heart is now an industry darling at Melbourne's various fashion events, making him a perfect candidate to represent the 2012 MSFW. The Designer Series will be fronted by runway beauty, Annaleise, while Emily's charm anchors MSFW@City Square. Industry new-comer Ebony will appear throughout the Emerging Designer Series, and Melbourne's 'it' boy, Jake, will be seen in a variety of shows and events throughout MSFW. Why? MSFW has unveiled 4 home-grown faces in its 2012 campaign. Hi when I click your link it says unauthorised... how do we get info on the shows?